A key realization for your organization, and any well-run company, is the knowledge that your data is an asset and you need to be ready to take the necessary steps to ensure its value is protected. There are four basic steps you need to consider for Data Management and Governance excellence. There’s no mystery to the data management process – it’s similar to the best practices you should be using as you manage all of your strategic business processes. Chances are that you have a few areas that require improved controls and data clean-up. While you will eventually want the entire enterprise following good data management and governance practices, it’s best to develop an improvement roadmap and build data discipline through a logical set of priorities. Where can you gain the most benefit? What area needs the most help? Decide on a prioritized game plan and use it to develop specific plans for success. 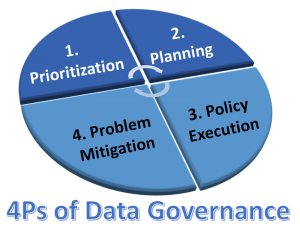 A recent blog, “Data Management and Governance – The Path to Success” [link], provides insight regarding roles and responsibilities for your data team. They should define the team’s mission and vision along with goals, metrics and Key Performance Indicators (KPIs). With that complete, they must evaluate the associated costs for managing, protecting and ensuring your data assets while making the data management process more efficient and effective. The team should determine how to best capture and evaluate data for quality, consistency and security. Automation will need to be considered for monitoring and enforcing compliance. This is a continuous improvement cycle that is not a “one and done” task. This process will be repeated as you expand throughout the enterprise. As your business changes and evolves, continue to review your approach and modify as necessary. Your data review and planning should be done on a regularly scheduled basis. Ensure everyone understand the standards, policies and the process of Data Management and Compliance. The entire organization must understand the need and benefit regarding the value of the company’s data assets and act accordingly. Develop and carry out a communications plan and any necessary training to build this discipline and competency into your organization’s culture. Regardless of how clear you are about data management and governance, there will be issues. Be prepared to address, manage and resolve any potential issues. Identify risks as early as possible. As you complete each new area, you will develop more confidence in your data and be able to use more accurate reporting to drive continuous improvement throughout your organization. A disciplined approach to data management will allow you to realize benefits across your organization so you must truly be considering your data as a valuable and important company asset. Here’s how a client used enhanced data and business process technology alignment to drive improvement, develop metrics and successfully manage their project portfolio at Leech Lake Gaming.